I was looking for a way to make an “apple” pie with less sugar, less fructose, and a gluten-free crust. I think I succeeded on all counts. I’ll just call it a Three-Fruit Pie for now; you’ll find out what it is when you get to the recipe. Spoiler alert: two of the three fruits are normally considered vegetables. You can tell from the picture that my new pie does not have a standard double crust with steam vents. I solved the soggy-bottom-crust problem by giving up. I made tart-sized pies that can be assembled just before serving so there is less time for the juices to soak in. The shells are baked empty along with small crust “cookies” to put on top and the filling is cooked separately in a saucepan. The pies can be served at room temperature or heated in the oven until piping hot and topped with a scoop of ice cream. The crunchy “sugar” crystals on top are granulated xylitol. Cooked chayotes have a texture like apples or pears. Tomatillos cook down to a jammy consistency. When combined, they make a thick, fruit pie filling very much like one made with apples. The cranberries give the filling a pretty pink tint that reminds me of quince. Make pastry. 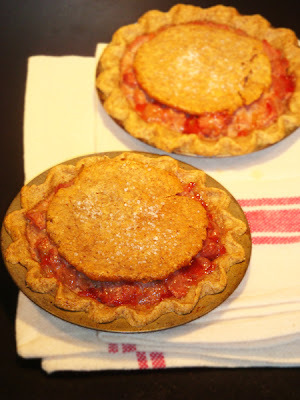 (A double crust for a 9-inch pie will make about 6 tart shells, depending on size. You may need more than one recipe of pasty to include top crusts.) Roll out pastry and cut to fit tart pans. Line pans with pastry and crimp edges. Cut a round of crust an inch or so smaller than the inside of the tart pan to use as top crust for each tart. Cut a small circle out of a square of foil and lay over crusts to protect edges from over-browning. Place tart shells and crust cookies on a cookie sheet and bake according to recipe directions until firm and lightly browned. Reserve. Cut chayotes in half along the puckered seam and remove seeds. Cut vertically into wedges, peel, and then thinly slice crosswise. Place in a dish, cover with water, and microwave on high until fruit is soft, about 20 minutes, stirring once or twice. Alternately, cook in a saucepan with water to cover until soft. Drain. You should have about 3 1/2 cups of cooked fruit. Remove the papery husks from the tomatillos and wash off the sticky residue. Chop into small pieces. If you are lucky enough to have hard, green tomatoes, remove the stem button and chop. Mix tomatillos and cranberries with cooked chayote and place in a large saucepan. Add water, sugar substitute, vinegar, cinnamon, ginger, salt, and lemon peel and bring to a simmer. Cover pan and cook on low, stirring occasionally, for about 10 minutes. Lightly beat the egg in a small bowl. Dip out some of the hot fruit juices and stir into the beaten egg. Return to the saucepan and cook and stir over low heat for about 5 minutes or until thickened. Stir in nuts, if using. Spoon filling into the baked tart shells. (Cool and refrigerate or freeze remaining filling if you are not serving all the tarts at once.) Place a crust cookie on top and sprinkle with granulated xylitol, if using. Serve at once or heat tarts in a 350 degree F oven until hot. Top with ice cream to serve. Makes 6 tarts, depending on size of tart pans, or one 9-inch pie. The Almond Pecan Pie Crust in Peter Reinhart and Deneen Wallace’s book, The Joy of Gluten-Free Baking (page 196), would also work. They have a crumb topping on page 199 that can be used instead of a top crust. Chayote squashes are light green and pear-shaped. Shop around for the best price; some stores in my area charge $1.99 each, but Safeway sells them for $.59. Tomatillos are small green, tomato-like fruits encased in a papery lantern. Most larger groceries sell them fresh. They can also be bought in cans, but I haven’t tried those in this recipe. 3 Fruit pie, Fruit tarts, Pie Crust. Bookmark. Sounds wonderful Judy! I've had a lot of trouble finding a pie crust for fruit pie that does not get soggy also. This sounds really good, for some day when I need to make a pie again. Love the 3 different "fruits" you have used! Thanks, Ginny! Let me know how yours turns out if you make it. I've only made it a few times, so I'm open to suggestions. What a great idea! What if you cooked the chayote squash in an apple pie flavoured tea from Celstial Seasonings or something (I can find that brand here). Maybe it would up the flavour? I'm going to try this if I can find chayote up here in Alberta. Thanks, I love your site! I have tried tea or hot cider mix in the past, but I think the cider vinegar gives a stronger apple flavor. (You can use a bit more if you like it stronger.) A little apple brandy would probably work even better. Or you could try all three at once. I think the cider and lemon peel give a pretty good "apple-y" taste. It is not exactly the same, but a new, pleasant flavor anyway. VANILLA BEANS I CAN ACTUALLY USE!